Google is making Gboard more useful than ever. This time with a little help from AI. Now, instead of requiring you to manually search for the perfect GIF, emoji, or sticker, Gboard will recommend the visual elements guaranteed to liven up your boring conversations. GIFs, emojis, and stickers have become an essential part of online discourse. I’m partial to GIFs myself, but others prefer adding emojis or stickers to their messages to add a personal touch. The problem is finding just the right one. All you need to do is type your message as usual. When Gboard spots an opportunity for you to add a GIF, emoji, or sticker, the GIF icon will flash. Click on it, and you’ll be presented with a selection of GIFs, emojis, and stickers Google thinks fit the conversation. This whole process is handled on your device, which means it’s faster and more private than it would be if Gboard was communicating with Google’s servers. And just because this feature exists doesn’t mean you can’t still conduct a manual search. The new recommendations have already been added to Gboard for Android. However, Google made no mention of if and when they’ll be added to Gboard for iOS. Still, Apple’s default keyboard already does something similar, suggesting emojis after certain words. Whether you’re new to Gboard or a seasoned user, you may be interested in these things you didn’t know Gboard could do 10 Things You Didn't Know Gboard for Android Could Do 10 Things You Didn't Know Gboard for Android Could Do The best keyboard for Android is probably the one that comes pre-installed: Gboard. But are you taking full advantage of all its great features? Read More . And since that article was published Gboard has learned how to turn your selfies into stickers Google Can Now Turn Your Selfies Into Stickers Google Can Now Turn Your Selfies Into Stickers Google's new Gboard feature, called Mini Stickers, turns you into an animated character, and all from a single selfie. 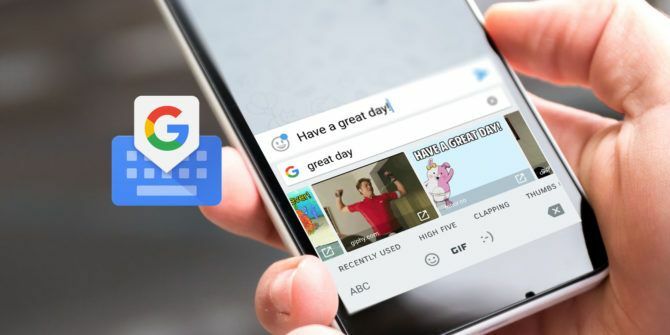 Read More , and how to understand morse code You Can Now Use Morse Code on Google's Gboard You Can Now Use Morse Code on Google's Gboard Google has incorporated Morse code into Gboard for Android and iOS. This is an attempt to help people with limited mobility communicate using their smartphones. Read More . Explore more about: Emojis, Gboard, GIF, Google.